The Vikings and star wideout Adam Thielen have agreed to a four-year, $64MM extension with a maximum value of $73MM, per Ben Goessling of the Star Tribune. He will earn $35MM in guaranteed money. We heard last month that the two sides were working on a new deal, and they were able to hammer out an agreement that pays Thielen at a rate commensurate with his abilities and recent production. Thielen had two years and $13.5MM remaining on his present contract, so as Mike Garafolo of the NFL Network tweets, it appears as if he is now under team control for the next six seasons at a $77.5MM base value. Ian Rapoport of NFL.com tweets that Thielen will receive $35MM in guaranteed money. 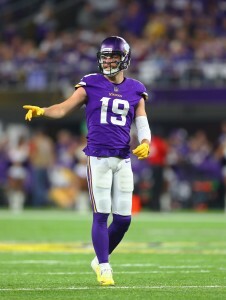 Of course, extensions can be difficult to come by when a player has more than one year remaining on his contract, but Thielen is not just any player. An undrafted Division II product, Thielen has put together back-to-back 1,200-plus-yard seasons, going for 1,373 and a career-high nine touchdown receptions in 2018. He watched teammate Stefon Diggs sign a five-year, $72MM extension with $40MM guaranteed last summer, and now he has leapfrogged Diggs in terms of average annual value (he is now the sixth-highest paid WR in the league in that regard). Thielen, who will turn 29 in August, has earned Pro Bowl nods in each of the last two seasons, and he figures to be a critical part of the team’s fortunes going forward. He was due to carry an $8.1MM cap hit this season, but that will likely be reduced as a result of the extension. His deal continues the Vikings’ trend of locking up core players before they can taste free agency. The team now has a foundation of Thielen, Diggs, Danielle Hunter, Linval Joseph, Anthony Barr, Eric Kendricks, Harrison Smith, Riley Reiff, Shamar Stephen, and Mike Hughes under contract through at least 2021 (hat tip to ESPN’s Field Yates on Twitter). Thielen will address the media tomorrow. It’s 4 years on top of the 2 years he was already locked into, so they have control of him for the next 6 years. Did y’all know he was from Detroit lakes?? Did I mention he’s from Detroit lakes?? Thielan of course is from Detroit lakes, mn & player his college ball in Mankato. The same Thielen from Detroit Lakes? He’s 29 now. In 6 years, 35. Does anyone out there seriously believe that at age 35 Thielen’s on field performance be comparable to his current level of performance? Thielen may not even want to continue to play as he enters the final 3 years of this extension.